The Computing School organised by the Commission on Crystallographic Computing focussed on advances in computerized methods and technologies, particularly (a) methods for single-crystal structure solution (with an emphasis on direct methods) and refinement techniques for 'small-molecule' and macromolecular structures, (b) computer graphics and program systems, and (c) database techniques. Identification key for participants at the 1987 Crystallographic Computing School. 1. Max Taylor, 2. James Stewart, 3. Kay Fair, 4. John Davies, 5. H. L. Carrell, 6. Dale Tronrud, 7. T. R. Welberry, 8. Michael Taylor, 9. Anthony Baker, 10. Frank Allen, 11. Bev Robertson, 12. Dennis Engel, 13. Bryan Craven, 14. Henk Schenk, 15. Alpana Seal, 16. Gert Kruger, 17. Roeli Oltof, 18. Rudolf Wartchow, 19. John Erickson, 20. Rolf Kruesemann, 21. Ward T. Robinson, 22. Chris Gilmore, 23. Suzanne Fortier, 24. Brian Skelton, 25. Alison Edwards, 26. Gillian Norris, 27. John Rollett, 28. Ben Bax, 29. Harren Jhoti, 30. Zygmunt Derewenda, 31. Eleanor Dodson, 32. J. Wilson Quail, 33. Anthony Willis, 34. Lata Prasad, 35. Staffan Sundell, 36. Joseph Noonan, 37. A. D. Rae, 38. Howard Flack, 39. David Waller, 40. Edgar Weckert, 41. Richard Ortega, 42. Wolfgang Hummel, 43. Rick Millane, 44. Peter Self, 45. Marie Fraser, 46. Ray Stevens, 47. Axel Brunger, 48. Gerard Bricogne, 49. Kunio Miki, 50. Miyako Miki, 51. Xinkan Yao, 52. Eric Gabe, 53. Kenneth Haller, 54. Jorge Garin, 55. Alan Hazell, 56. Nancy L Morris, 57. John Orbell, 58. Sandra Cowan, 59. Norma Duke, 60. Zihe Rao, 61. Luke Guddat, 62. William Tulip, 63. Susan Hambling, 64. Rita Hazell, 65. Gunter Bergerhoff, 66. Daniel Vercauteren, 67. K. Sivakumar, 68. Philip Bourne, 69. Pedro Alzari, 70. Hendrikus Van Koningsveld, 71. Kiwako Sakabe, 72. Noriyoshi Sakabe, 73. Robert Stodola, 74. Manfred Moeller, 75. J. K. Dattagupta, 76. Louise Cunane, 77. Z. Baran, 78. Peter Seidel, 79. Sundar Gopal Biswas, 80. Erdong Wu, 81. Jane Burridge, 82. David Watkin, 83. Phathana Phavanantha, 84. Chaveng Pakawatchai, 85. Sukla Paul, 86. Virginia Pett, 87. Gabriele Lampert, 88. Miriam Rossi, 89. Jury Mohyla, 90. Uri Shmueli, 91. Diana Tomchick, 92. Natalie Strynadka, 93. Frank Herbstein. 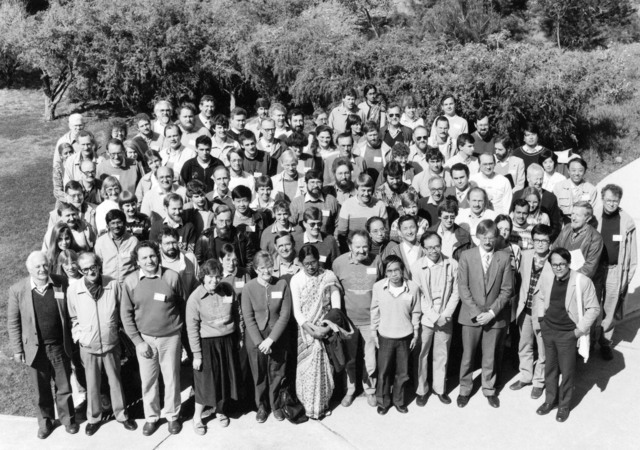 Participants at the 1987 Crystallographic Computing School. A separate schematic key identifies each individual. 1. Max Taylor, 2. James Stewart, 3. Kay Fair, 4. John Davies, 5. H. L. Carrell, 6. Dale Tronrud, 7. T. R. Welberry, 8. Michael Taylor, 9. Anthony Baker, 10. Frank Allen, 11. Bev Robertson, 12. Dennis Engel, 13. Bryan Craven, 14. Henk Schenk, 15. Alpana Seal, 16. Gert Kruger, 17. Roeli Oltof, 18. Rudolf Wartchow, 19. John Erickson, 20. Rolf Kruesemann, 21. Ward T. Robinson, 22. Chris Gilmore, 23. Suzanne Fortier, 24. Brian Skelton, 25. Alison Edwards, 26. Gillian Norris, 27. John Rollett, 28. Ben Bax, 29. Harren Jhoti, 30. Zygmunt Derewenda, 31. Eleanor Dodson, 32. J. Wilson Quail, 33. Anthony Willis, 34. Lata Prasad, 35. Staffan Sundell, 36. Joseph Noonan, 37. A. D. Rae, 38. Howard Flack, 39. David Waller, 40. Edgar Weckert, 41. Richard Ortega, 42. Wolfgang Hummel, 43. Rick Millane, 44. Peter Self, 45. Marie Fraser, 46. Ray Stevens, 47. Axel Brunger, 48. Gerard Bricogne, 49. Kunio Miki, 50. Miyako Miki, 51. Xinkan Yao, 52. Eric Gabe, 53. Kenneth Haller, 54. Jorge Garin, 55. Alan Hazell, 56. Nancy L Morris, 57. John Orbell, 58. Sandra Cowan, 59. Norma Duke, 60. Zihe Rao, 61. Luke Guddat, 62. William Tulip, 63. Susan Hambling, 64. Rita Hazell, 65. Gunter Bergerhoff, 66. Daniel Vercauteren, 67. K. Sivakumar, 68. Philip Bourne, 69. Pedro Alzari, 70. Hendrikus Van Koningsveld, 71. Kiwako Sakabe, 72. Noriyoshi Sakabe, 73. Robert Stodola, 74. Manfred Moeller, 75. J. K. Dattagupta, 76. Louise Cunane, 77. Z. Baran, 78. Peter Seidel, 79. Sundar Gopal Biswas, 80. Erdong Wu, 81. Jane Burridge, 82. David Watkin, 83. Phathana Phavanantha, 84. Chaveng Pakawatchai, 85. Sukla Paul, 86. Virginia Pett, 87. Gabriele Lampert, 88. Miriam Rossi, 89. Jury Mohyla, 90. Uri Shmueli, 91. Diana Tomchick, 92. Natalie Strynadka, 93. Frank Herbstein. Opening Dinner. 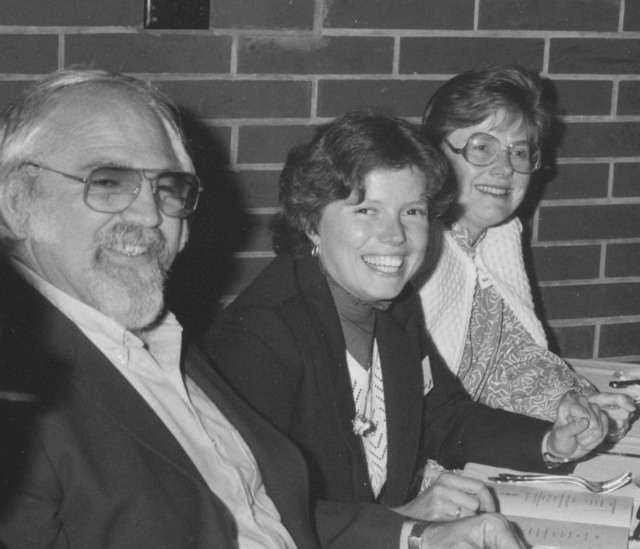 Bud Carrell, Miriam Rossi, Virginia Pett. Opening Dinner. 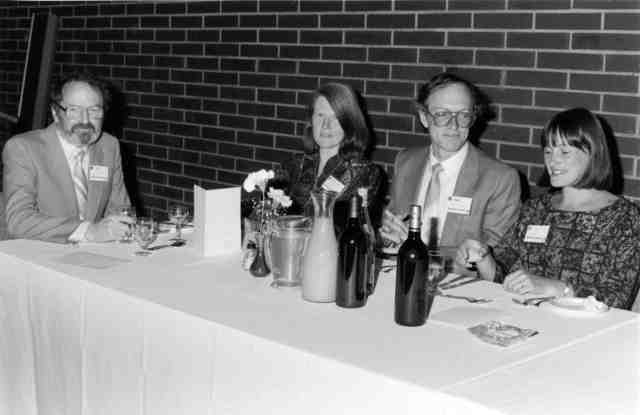 Max Taylor, Eleanor Dodson, Neil Isaacs, Suzanne Fortier. Max Taylor, Neil Isaacs, Suzanne Fortier, Guest Speaker The Hon. 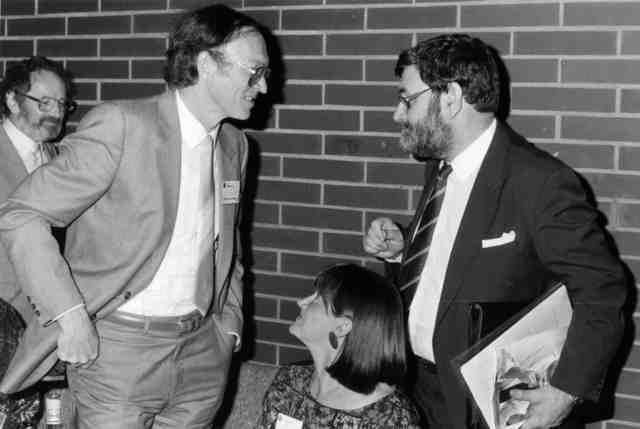 Barry Jones, Minister for Science. Excursion lunch. 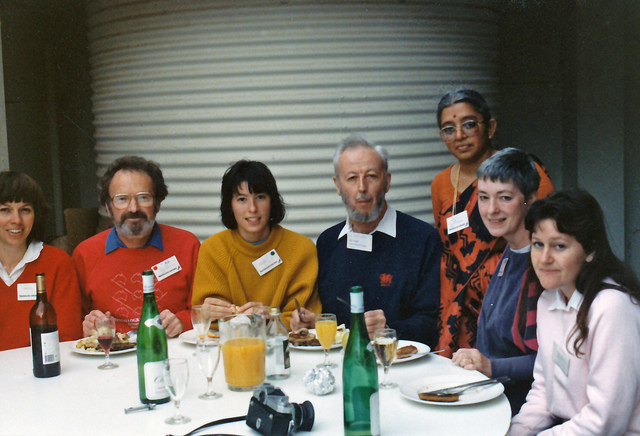 Rosemary Taylor, Max Taylor, Jacquie Gabe, Eric Gabe, Lata Prasad, Maureen Gabe, Julianna Csavas.